90% people in North America are diagnosed with dental caries while out of all dentate adults almost 94% have evidence of coronal caries, as per WHO statistics. According to Centers for Disease Control and Prevention (CDC) report 47.2% of the total population in the U.S. who are above 30 years suffers from periodontal disease. The dental service market is expected to grow at a CAGR of 10.1% during the forecast period. Upcoming laser dentistry and painless treatment and collaboration with leading insurance providers are driving the dental service market with higher rate. Growing healthcare awareness, increasing healthcare expenditure, rising trend of National Rural and Urban Health Missions, increasing number of private dental offices, increasing market for outsourced services to healthcare providers and patient empowerment have led to demand for better dental care facilities at affordable prices. However, incomplete dental treatment program, inadequate services for treatment in rural areas and high cost of treatment are expected to impact the target market negatively. On the account of escalating demand for cosmetic and elective dentistry, dental implants hold the major share i.e. 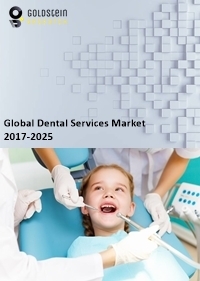 22.35% of global dental service market while cosmetic dentistry is the fastest growing segment owing to correct imperfections in the appearance of the mouth, registering the CAGR of 9.78% over the forecast period. Asian market has witnessed the highest growth rate of 10%, followed by the US at 5.5%. India offers enormous investment opportunities, on account of being a manufacturing hub of dental products, in foreign direct investments, outsourcing to healthcare BPO’s and sectoral growth in the field of telemedicine, diagnosis, etc. Germany, US, China, Italy, Japan are the major importers of dental products to the countries like India, UK, Indonesia, Brazil, Mexico, Canada, etc. The India Dental Service Market is expected to grow at a CAGR of 7.34% during the forecast period and accounted for USD 1.55 billion in 2017. The report covers the present ground scenario and the future growth prospects of the Dental Service Market for 2017-2025 along with the market players’ analysis. We calculated the market size and revenue share on the basis of revenue generated from major players worldwide. Global Dental Service market is forecasted on the basis of revenue analysis, product benchmarking and strategic developments of key market players. Global Dental Service Market Outlook 2017-2025, has been prepared based on an in-depth market analysis from industry experts. The report covers the competitive landscape and current position of major players in the Dental Service market space. The report also includes porter’s five force model, SWOT analysis, company profiling, business strategies of market players and their business models. “Global Dental Service Market Report” also recognizes value chain analysis to understand the cost differentiation, pricing models to provide competitive advantage to the existing and new entry players. Our Global Dental Service Market Report comprises of the following companies as the key players: Apollo White Dental, Dental Services Group, Pacific Dental Services, Great Expressions Dental Centers, Gentle Dentistry, LLC, Coast Dental Services, LLC. What is the total revenue per segment and region in 2016-17 and what would be the expected revenue per segment and region over the forecast period?